Lost in the funhouse of Cold War history, released at the Cuban missile crisis’ most dangerous moment, The Manchurian Candidate anticipated—by thirteen months—the assassination of an American president and then vanished from circulation off and on for most of the next quarter century. Lamenting the ways that he’s not “lovable,” Laurence Harvey channels the reptilian persona of previous screen roles into the part of a brainwashed Korean POW who somehow is chilling and heartbreaking at the same time. Planting an incestuous kiss on the lips of her son, Angela Lansbury (notoriously only three years older than Harvey) is an oedipal matriarch creepy enough to foreclose any lesser actress’ possibility of a long-term TV career as a prim detective; and as a career military officer on the verge of a crackup, Frank Sinatra gives his best performance outside classic ‘50s torch albums like In the Wee Small Hours and Only the Lonely. 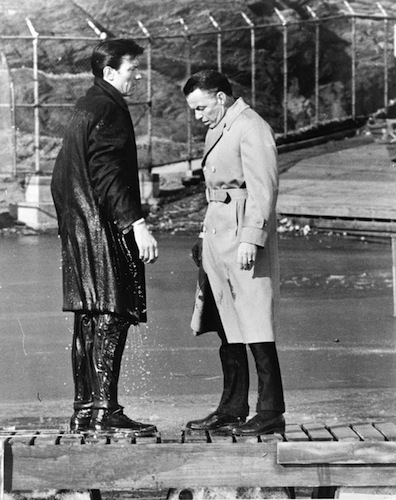 Accounting in no small degree for the jag and wooziness of John Frankenheimer’s direction and Lionel Lindon’s black and white cinematography is that so many of the scenes are first takes (when the camera wasn’t always in focus), because those were Sinatra’s best. At the cross coordinates of surrealist thriller and paranoid satire, The Manchurian Candidate is pitched at the level of a barely repressed frenzy that knows no ideology. This is either a remarkably cracked left-wing view of the right or the other way around. Madness and suspicion become so much the film’s modus operandi that soon every oddball scene, including one of the strangest come-ons ever—Janet Leigh picking up Sinatra between cars on a train—lends itself to interpretations the filmmakers never dreamed of, at least not consciously. Though Jonathan Demme’s remake of 40 years later was hardly the disgrace some suggest, in no way could it replicate the original’s bone-deep hysteria.